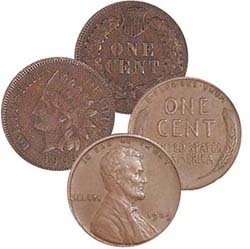 ← Can You Find Any Worthwhile Coins in Pocket Change? I’ve never met a coin collector who felt their collection was complete. There is always that one last issue to find, another series to start, more coins to acquire. But there is great accomplishment in compiling a complete series or finishing a grouping. One great way to get that feeling of completion is to put together a set with just a few coins. “Shared date” coin pairs can be the perfect solution. Here are four pairs to get you started. You can collect one, or try for all four and have a wonderfully historic collection of meaningful U.S. coins that help you glimpse the progression of history. Occasionally U.S. coin series overlap, one ending in the same year that the new design replacing it begins. Thus two coins of the same denomination, from completely different coin series, can share the same date. These coins make a wonderful pairing and can be a complete collection all on their own. The Indian Head cent with its quintessentially American Indian Princess design was first issued in 1859. The series ended on its 50th anniversary in early 1909, when the new Lincoln cent emerged to commemorate the 100th anniversary of Abraham Lincoln’s birth. The Buffalo nickel, first issued in 1913, was designed using three different Indian chiefs as models for the realistic obverse portrait. The reverse was modeled after “Black Diamond,” the bison in the New York Central Park Zoo. In 1938 the Jefferson nickel replaced the coin after its required 25 years of service, becoming America’s third regular presidential coin. Issued from 1892-1916, the Liberty Head dime was the last to share its obverse engraving with the quarter and half dollar of its day. On the year it completed its 25th year of issue, the Liberty Head dime was replaced by the stunning Mercury dime. The “Mercury” obverse is actually a personification of Liberty, with wings on her cap symbolizing freedom of thought. The Morgan silver dollar series was suspended in 1904. Then, in 1921, the government decided that more Morgans were needed, since many silver dollars had been melted during World War I. In December 1921, a new dollar with the inscription “PEACE” and an ardent new Liberty emerged to commemorate the U.S.-Germany Peace Treaty of that year, formally ending World War I. None of these coins are particularly pricey and all can be found quite easily. Start with a manageable grade (Click here to learn more about “What Grade Coins to Collect”) and trade up as you can afford better quality coins. I will warn you that these inexpensive, quick to assemble coin pairings can lead to the desire to start collecting an entirely new coin series! This entry was posted in Uncategorized and tagged Coin collecting ideas, Coin short set, Interesting coin collection ideas, Shared date coins, What coins should I collect. Bookmark the permalink.